Add a Gigabit Ethernet port to your MacBook, Chromebook or tablet. Gain fast, reliable network access for your MacBook, Chromebook or tablet, even if it doesn't have an Ethernet port. 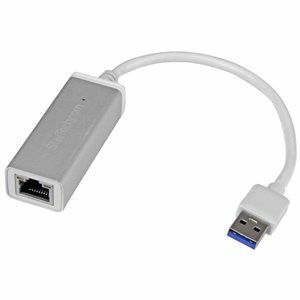 This USB 3.0 to Gigabit network adapter adds a single RJ45 Ethernet port to your computer through your USB 3.0 port. It installs instantly - with no driver required.Engineered with a quality aluminum housing in a silver finish, the network adapter is the perfect companion for your MacBook, Chromebook or tablet. Compact and portable, this USB network adapter is the ideal laptop accessory. You don't have to carry a power adapter with you to use it, because it's powered directly from the host USB port.Ideal for office or home use, the USB 3.0 network adapter supports full Gigabit bandwidth by harnessing the performance of USB 3.0 (5 Gbps). You can quickly access very large files over a Gigabit network, saving valuable time every day. The Realtek chipset gives you the assurance of reliable performance.Get up and running quickly. Simply plug this Ethernet cable adapter into the USB port on your laptop and connect to your network. The network adapter chipset provides native driver support, so you don't have to worry about installing additional software.